Holland has always been a country of great horticultural skills - and the centre of Europe's horticultural industry. From the end of March to May each year, Keukenhof Gardens (the world's largest flower garden - 7 million flowers in a 70 acre park) showcases the Dutch bulb growers industry with new displays and hybrids each year of tulips, hyacinths, crocus, narcissi and daffodils. 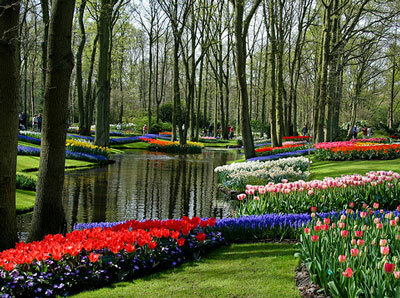 Mid April is probably the best time to visit Keukenhof as all the different species will be in bloom. The Dutch classical garden style is based on the Italian style. Dutch classical gardens are rectangular in shape and enclosed by tree-lined canals. Towards the end of the 17th century, the French baroque style was very influential. The gardens at Het Loo are an example of this. Built by William III of Orange in 1685, the Het Loo Palace is a beautifully restored 17th century palace. Het Loo is often referred to as the "Versailles of Holland". In the 19th century, there was a move away from enclosed gardens to a much more open style of garden. There is an annual open garden weekend of private gardens in Amsterdam in the third week of June organised by the Canal Museums. The tour includes Keukenhof with its impressive display of a staggering 7 million spring bulbs, the fascinating baroque garden at Palais Het Loo and the visit the Rijksmuseum in Amsterdam, now fully reopened after a major refurbishment. This is a new destination for Hortus, travelling to see the gardens of Zuid-Holland, Zeeland & Noord-Brabant in the far south-west of the Netherlands whose inhabitants historically were either at sea or keeping the sea away from home & hearth. Five major rivers create a complex delta of islands and rich mineral deposits, the basis of extremely good soils for gardens and horticulture. Staying at Hotel Villa Augustus is a unique experience: a quirky, upmarket hotel in Dordrecht. Intricate, highly productive vegetable gardens supply the restaurant serving good, innovative Dutch food. If you choose to visit Holland's gardens with a tour group, it is important to be clear on what your priorities are. Many tours focus on the spring bulb displays, which is fantastic, if that is what you came to see. However, if you are interested in Holland's historic gardens, you will have to be discerning in choosing a tour. Some tours give you the opportunity to enjoy both. Holland is a small and densely populated country with an excellent public transport system for the independent traveller. The road system is also excellent but the main roads are crowded and can be daunting for the foreign visitor.